PT Kimia Farma (Persero) Tbk - Kimia Farma is a reputable state-owned company in Indonesia with core business in healthcare and pharmaceutical industry. Its business include pharmaceutical manufacturing, trade and distribution, pharmaceutical retail and international trade. 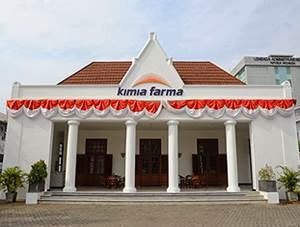 Kimia Farma was established under the name of NV Chemicalien Handle Rathkamp & C in 1817 during Indonesia's colonial days. In 1958, the company changed its name to PNF Bhinneka Kimia Farma , and to PT Kimia Farma (Persero) in 1971. The Company was listed and frst traded its shares on the Indonesia Stock Exchange (IDX) in 2001, with trading code KAEF. At present, Kimia Farma is 90.025% owned by the Government of Indonesia, 0.152% by management/employee and other remaining sahres was owned by public. Headquartered in Jakarta, Kimia Farma now has 5 directly-owned subsidiary and affiliated companies, namely PT Kimia Farma Trading & Distribution, PT Kimia Farma Apotek, PT Sinkona Indonesia Lestari, PT Kimia Farma Diagnostik and PT Asuransi InHealth Indonesia. As of December 2015, Kimia Farma has 5 pharmaceutical plants, 47 trading distribution branches, 725 pharmacies, 43 laboratory clinics and 315 medical clinics throughout Indonesia. In term of financial performance, Kimia Farma is running well in the full year of 2015. Total sales in 2015 amounting to Rp 4,860.37 billion, or a growth of 7.51% of total sales in 2014 amounting to Rp 4,521.02 billion. While net income in 2015 amounting to Rp 252.97 billion, or 6.95% higher than the previous year of Rp 236.53 billion, according to PT Kimia Farma (Persero) Tbk Annual Report 2015 as quoted by JobsCDC.com. Bachelor Degree or equivalent (S1 / D4), majoring in Taxation. Able to work individually and in teams. Possess certification in tax Bravet A & B. Have an understanding of SPT & PPh 21, PPh 23 & PPh 25. Have an understanding of Tax Bookkeeping. Mastering Ms Office (Ms Word, Excel, and Power Point). Have an understanding of basic accounting and taxes. JobsCDC.com now available on android device. Download now on Google Play here. Please be aware of recruitment fraud. The entire stage of this selection process is free of charge. PT Kimia Farma (Persero) Tbk - Recruitment Taxation Staff Kimia Farma August 2016 will never ask for fees or upfront payments for any purposes during the recruitment process such as transportation and accommodation.